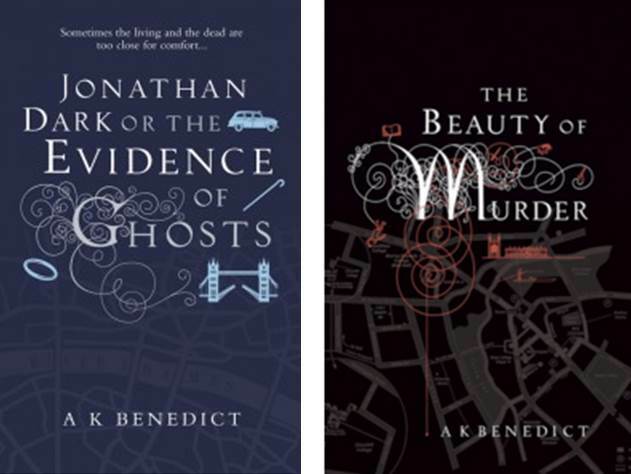 It’s been a busy week for the London based book reviewers, journalists and critics that trawl the darkest edges of literature, namely crime mystery and thriller fiction; as publishers are preparing their 2016 work for market. Last week we attended the Hodder & Stoughton, Headline and Quercus Publishing Party, held alongside the Embankment of London’s Thames. 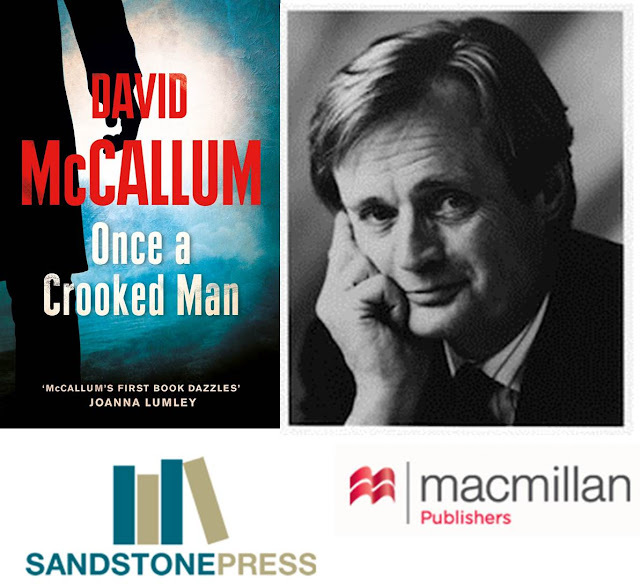 All three publishers form a significant segment of the Hachette Publishing group, and fitting within the Hodder & Stoughton imprint is the UK division of Mulholland Books, which showcases some of the more unusual offerings, such as David Morrell’s award-winning historical series featuring Thomas De Quincey and the DS McAvoy series from Hull based journalist David Mark, to name just two of their authors. Just out from Mulholland is Mark’s fifth novel DEAD PRETTY, and what a dark ride it is indeed, as our reviewer discovered. 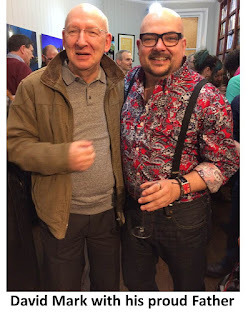 So it was a delight to attend the launch party that Hodder and Stoughton had organised in-conjunction with London’s Goldsboro Books, in Covent Garden. 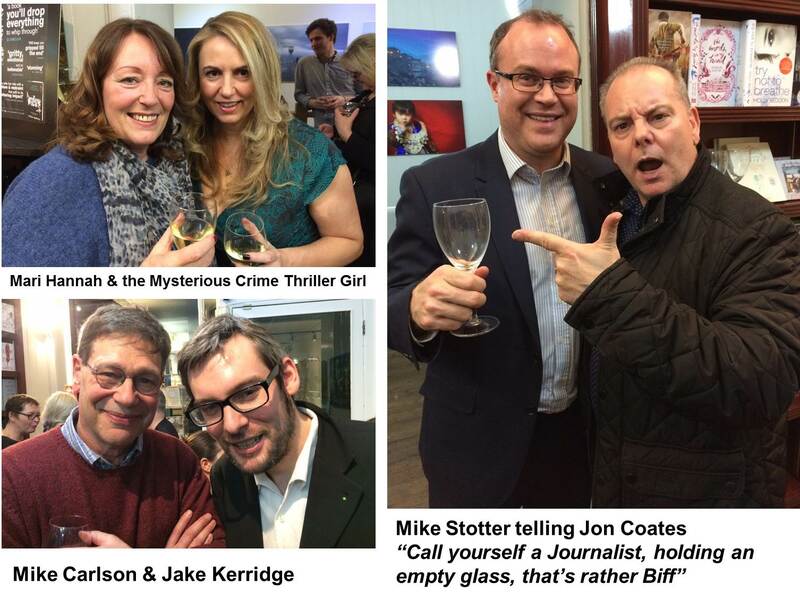 The Hodder Team were out in force with Nick Sayers, Kerry Hood and David’s editor Ruth Tross. 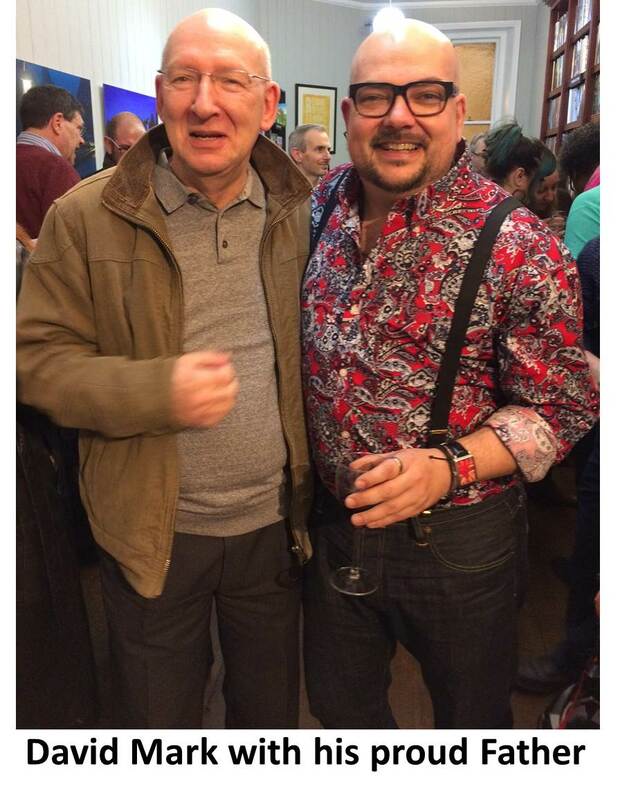 There are two kinds of crime writer. There are the high-profile, starry figures, routinely called upon to be pundits for the genre – and whose prestige allows them to get away (almost scot-free) with the odd misfiring book. And then there are the others: the quiet, hard-working professionals who simply get on with the job, delivering reliable, readable fiction that may not have any truck with innovation or experiment, but delivers the kind of reader-pleasing product (misfires discouraged) that ensures their contracts are renewed regularly. Mari Hannah is in the latter group, and over a solid series of books has built up a faithful following. With her pithily drawn Northumbrian settings, Hannah has produced a compellingly readable series featuring gay copper DCI Kate Daniels, which has maintained a satisfyingly dark and tense atmosphere, the pungent characterisation matched by persuasive detail of forensic and policing methods. 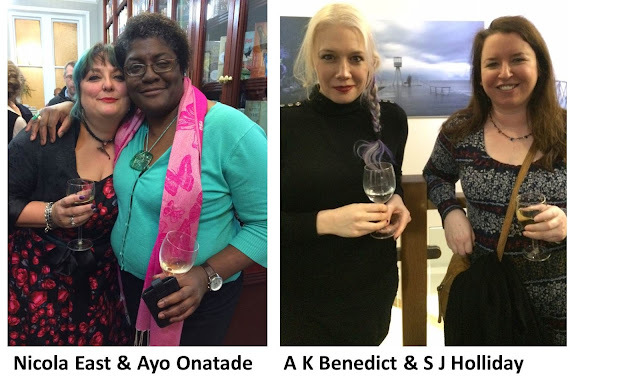 I was also delighted to have a chat with writers Susi S J Hollliday and Alexandra A K Benedict. Susi and I had been in communication prior to Bouchercon Raleigh on the panel planning, and the curious thing was during the event in North Carolina, due to my frantic programming tasks, I actually hadn’t seen her at the event, but then again attendance was over 1,400 people, and I was never in one place for more than a minute or two, as I wondered around checking panels, sorting last minute problems, and basically ensuring the event ran as smoothly as our team could manage. I was looking forward to Alexandra Benedict’s follow-up to her debut novel The Beauty of Murder – which was titled Jonathan Dark or The Evidence of Ghosts due for release in February from Orion Publishing, as her work is in a favourite subgenre / hybrid of mine, one that merges crime and mystery with horror and the weird. 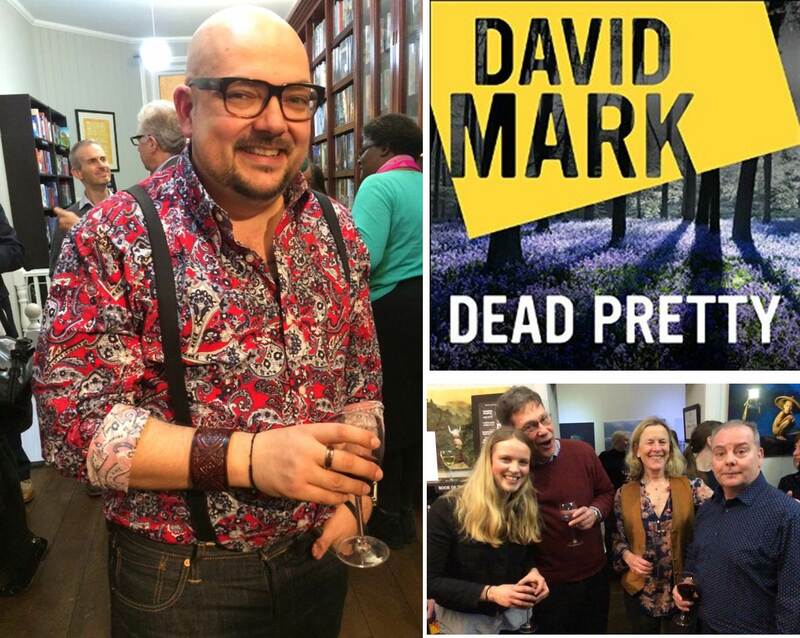 Anyway, with much mingling, and Kerry Hood ensuring our glasses of wine were kept topped up; Ruth Tross, took to the front to introduce David Mark and his new work, DEAD PRETTY followed by David himself giving his usual self-deprecating welcome to all the guests who came to celebrate his latest DS McAvoy thriller. His speech was very amusing, in fact I have noticed that the writers that write the toughest narratives tend to be the nicest of people, and David is no exception. 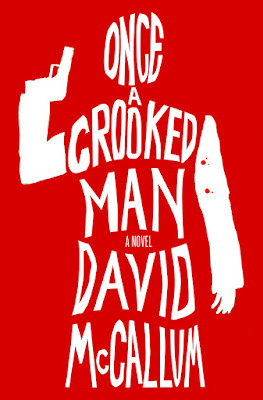 David is gaining traction in the US and I was delighted to hear that he and his wife Nicola are planning attending Bouchercon “Blood on the Bayou” in New Orleans later this year. This will be David and Nicola’s first Bouchercon so they were keen to listen to the experiences of Mike Stotter and I, and we were delighted to hear that Ruth Tross of Hodder / Mulholland was also going to attend, so the British Contingent was taking shape. The event is being chaired by the best-selling author and musician Heather Graham, so click here for a free eBook on why Heather loves New Orleans. So after the party, we thanked David Headley of Goldsboro Books, and the team from Hodder and Stoughton / Mulholland Books for their hospitality, and headed for some dinner, where Mike and I discussed plans for our trip to New Orleans, as well as priorities on reviewing and upcoming Shots features. We were both very encouraged at the exclusive telephone call with David McCallum which though concise [due to his busy schedule] revealed details on his engaging debut crime novel, “Once a Crooked Man”. 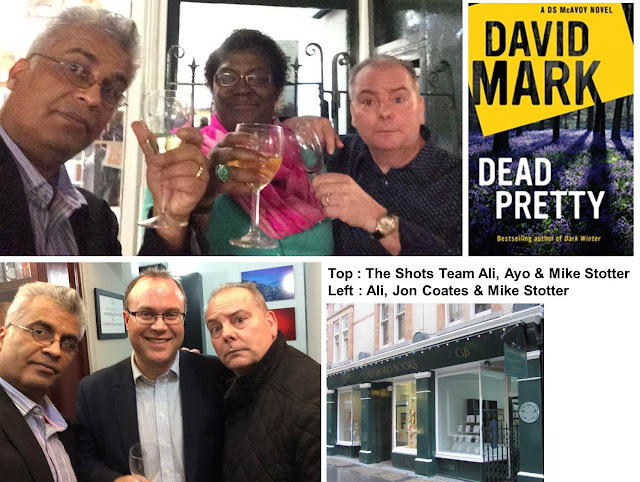 As we left the restaurant, by sheer serendipity, we noticed Ruth Tross, David Mark and Nicola East with some others standing outside a bar and of course David’s booming laughter – so we joined them for a night cap, and toasted the success of Journalist David Mark, turned best-selling crime-writer, a man with a pitch-black imagination, but with a sense of humour and wit that makes his work, dare I say unique. 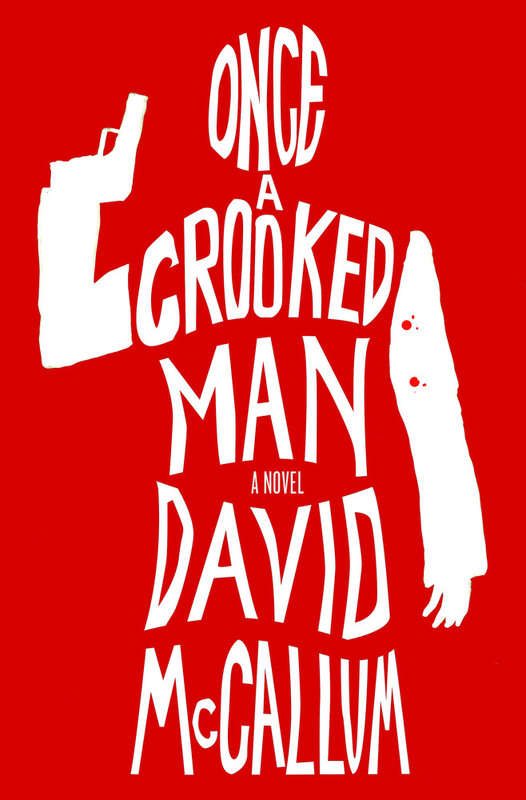 If you haven’t discovered the world of DS McAvoy, then you are in for a treat, but be warned these are very gritty and tough detective novels, but are striated with a knowing eye, and with a social conscience. A reading committee of IACW/NA members selected the nominees, based on recommendations from other members and the publishing community. The organization will name the HAMMETT PRIZE winner, during the NoirCon literary conference in Philadelphia, October 26-30, 2016. 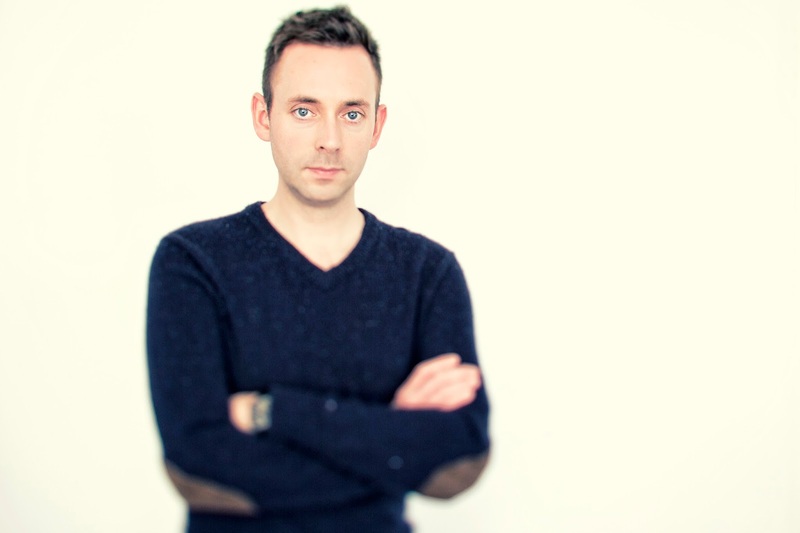 The winner will receive a bronze trophy, designed by sculptor Peter Boiger. 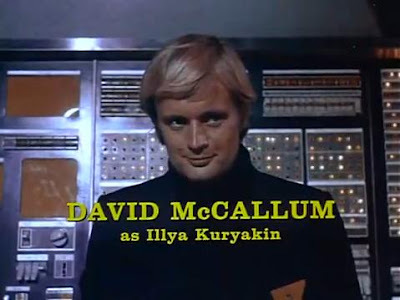 , rather than Illya Nickovitch Kuryakin. So Sandstone Press were as good as their word, and I tore through this good natured international caper narrative in two sittings, for it has the pace of sprint, with a quirky style that made me smile when I put the book down. 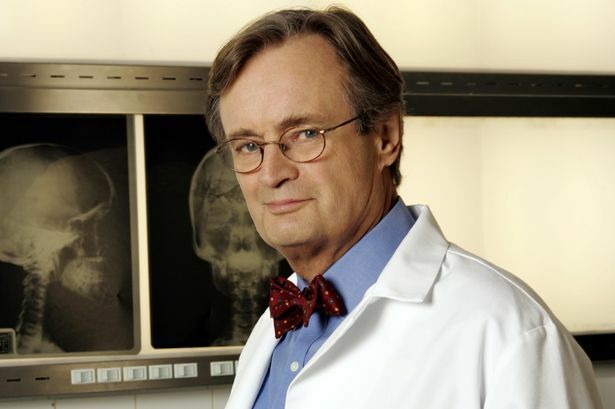 Ali : I couldn’t but help myself picture David McCallum as your main protagonist Harry Murphy, as the old adage ‘write what you know’ often hints at; however the book does contain investigators, criminal families, romance and security issues, so did the novel require much research? One of the reasons I wrote Nightblind was to tackle two myths about Iceland. The first is that Icelanders are a nation with no guns. This is a very prevalent myth, largely because Iceland is a very peaceful place, usually ranking at the top or near the top of lists of the most peaceful countries on earth. Furthermore, the Icelandic police are quite famous for being unarmed, although this is no longer the case. Some police cars are now equipped with handguns, a sign of changing times perhaps. But the truth is that Icelanders have a lot of guns – although they are mainly hunting weapons, of course. There have been reports of 60,000 registered firearms in Iceland, which means that one in five Icelanders has a gun, and Iceland has been ranked No. 15 in the world, in terms of gun ownership per capita. 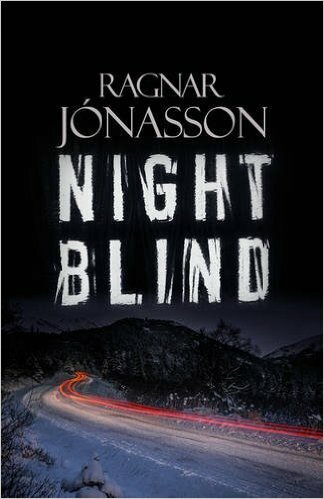 This subject is tackled in Nightblind when the local police inspector is shot at point blank range with a shotgun – a hunting gun presumably stolen from a local teacher who kept it in an unlocked garage. As the investigation proceeds, it becomes clear that there are far more weapons on the streets than previously imagined, even in a small place like Siglufjordur! The second myth is that Iceland is a country with no violence. Again, this has something to do with the ‘peaceful-country’ ranking (and Iceland is very peaceful) and the fact that we have very few murders (far fewer than you would think, reading Icelandic crime novels). However, I wanted to draw attention to the hidden violence that exists in all countries: domestic violence. And Iceland is no exception. 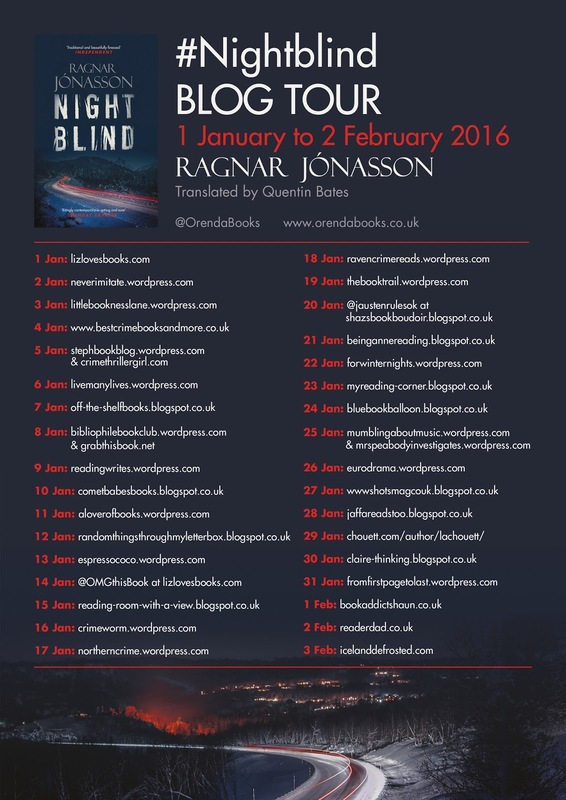 It can be said that the horror of domestic violence is a main thread throughout the book, but I think I won’t elaborate further on that – I’ll let the readers of Nightblind discover more for themselves … Domestic violence usually take place behind closed doors and, like it is in many countries, is often under-reported. Who knows what’s going on behind those doors, as the long, dark winters draw in? Any country can appear peaceful on the surface, but most have a simmering rage that leads to violence at home. It’s worrying, and it’s a trend that it is increasing worldwide. I once had the opportunity to interview the great P.D. James for an Icelandic newspaper, and she told me that the traditions and structure of a detective story could be used to say something about men and women under the stress of a police investigation, and the society in which they live. I tend to agree with that, so my novels usually, directly or indirectly, address a topic that I find interesting or important. Of course I also try not to lose sight of the fact that I am writing a crime novel with a focus on characters, setting, plot and a twist in the end … And it is surely in the most compelling stories that the truth can be told, the myths shattered, and issues brought to the surface, as readers absorb information through entertainment. It’s a powerful vehicle for change, and that’s one of the reasons why I love writing crime fiction. Siglufjör› ur: an idyllically quiet fishing village on the northernmost tip of Iceland, accessible only via a small mountain tunnel. Ari Thór Arason: a local policeman, whose tumultuous past and uneasy relationships with the villagers continue to haunt him. The peace of this close-knit community is shattered by the murder of a policeman – shot at point-blank range in the dead of night in a deserted house. With a killer on the loose and the dark arctic winter closing in, it falls to Ari Thór to piece together a puzzle that involves tangled local politics, a compromised new mayor, and a psychiatric ward in Reykjavik, where someone is being held against their will. Then a mysterious young woman moves to the area, on the run from something she dare not reveal, and it becomes all too clear that tragic events from the past are weaving a sinister spell that may threaten them all.